Naughty Dog’s most amazing art, the demonstration of how incredible of a medium games are, is compiled into one crazy set that feels as if the package was handcrafted by Dark Horse. I searched for this awesome book for several months after learning about its existence. I had given up on trying to find one that didn’t consist of a crazy ebay listing, and due to the fact they’re limited print, I just went and purchased the regular edition. However, while at NYCC 2014, a friend of mine had requested we stop by Dark Horse’s booth to look for something of interest for him. They didn’t have what he was looking for, but just out of the corner of my eye as we walked away, I noticed a really cool looking Final Fantasy art book. I immediately jumped to it, and hidden just to the left of it, was this epic box. I cried out loud like a little girl, I kid you not. Everyone looked at me, and the Dark Horse rep laughed as I lifted the last copy off the shelf. 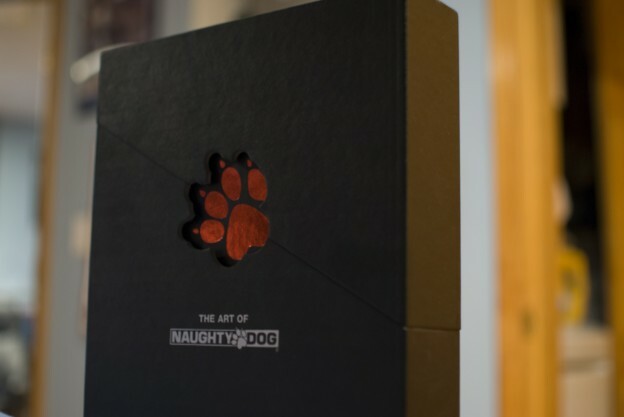 I am extremely happy with The Art of Naughty Dog. This entry was posted in Review and tagged art, book, concept art, naughty dog, playstation, recommended reading, review on October 14, 2014 by Anthony Barranco.